I don’t know about you, but I’ve always wanted to be able to perform a neurological exam and pick the lesion and look good doing it. Over the years I’ve tried to get better at it. What I have put together is a series of ‘PEARLS’ that sometimes help me decipher the cryptic world of Neurology. Here are a few. If you can perform only one test of upper limb motor function, this is the test to do. It can pick up subtle changes that would not be picked up by a routine motor examination. Ask the patient to extend both arms in front of them at shoulder height with palms facing upwards, as if they were carrying a tray. They first do this with eyes open for 10 seconds and then they hold the position and close their eyes and count to 10. A Normal Response will result in either no movement, or a slight pronation of both sides ie., symmetrical. Eyes Open: If there is an upper motor neuron(UMN) lesion, the affected arm will pronate and drop. This occurs because in an UMN lesion that is not resulting in upper limb flaccid paralysis, may minimally affect the corticospinal tracts(CST). If these are affected, those muscles such as the flexors and pronators that are unaffected will overpower the weaker muscles ie., supination is weaker than pronation. Eyes Closed: If the Pronator Drift is positive with eyes closed but not when the eyes are open there may be proprioceptive involvement ie., posterior columns. In cerebellar disease the arm may drift up and outwards(usually towards the side of the lesion), or may drift aimlessly. A further test is overcorrection ie., give the palm or the arm a tap and it will overcorrect, never going back to its original position. Another form of the rebound test, other than tapping on the arm and seeing if it corrects appropriately, is to ask the patient to push or pull against you with their arm. You hold a constant amount of force against the limb, then suddenly let go(being careful not to injure the patient or yourself). Usually the antagonist muscles will stop the limb after a short movement. In cerebellar disease, the rebound phenomenon is absent and the arm will continue to move, hitting either you or the patient. Downward drift of the arm without pronation, is usually the result of functional paresis. Conversion Disorder is a Psychiatric Disorder and the finding of ‘Pronation without Drift’ appears to be very sensitive and specific for this(3). 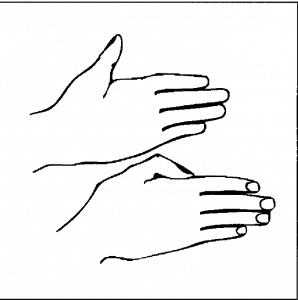 In this test the patient is asked to hold their arms outstretched on their laps, with palms facing each other and thumbs resting on the index finger. They are then asked to raise them upwards quickly to shoulder level. Those with involvement of the corticospinal tracts have an upping thumb(4). It has been found to be a sensitive and reliable marker of UMN disease(5). Today I et al. Pronation Test: eyes closed or open? Eur Neurol. 2007;58(2):65-9. Daum C et al. Validity of the “Drift without pronation” sign in conversion disorder. BMC Neurol. 2013; 13: 31. Hachinski V. The Upping Thumb Sign. Letters to the Editor. Arch Neurol. 1992;49(4):346.